Listen as Charles Spurgeon explains one of the ways that God will deliver you from Satan’s net. “Very often by trouble. Trouble is often the means whereby God delivers us from snares. You have all heard of the old story of the celebrated painter who was painting in St. Paul’s. Looking at his work, one day, he went gradually back, inch by inch, to get a view of it so that he might see the excellence of its proportions—until his feet were just on the edge of the platform upon which he stood. He would have fallen down and been dashed in pieces upon the pavement beneath but just at that moment a workman who stood there, desirous to save his life and not knowing how to do it, hit upon an expedient, which proved to be a very wise one. Instead of shouting out to his master, “Sir, you are in danger,” which would most certainly have sent him backward, he took up a brush and dipping it in a pot of paint, dashed it at the picture. The good man rushed forward in anger to chastise him—but when it was explained, he clearly saw that his servant had acted wisely. Just so with God. You and I have often painted a fine picture and we have been walking backwards admiring it. God knows that our backsliding will soon end in our destruction. And He, by a sad Providence, blasts our prospect, takes away our child from us, buries our wife, removes some darling object of our pleasures and we rush forward and say, “Lord, why this?”—utterly unconscious that if it had not been for trouble, we might have been dashed in pieces and our lives would have been ended in destruction! I doubt not that many of you have been saved from ruin by your sorrows, your griefs, your troubles, your woes, your losses and your crosses. 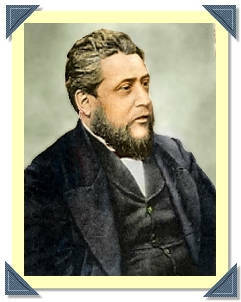 This is a brilliant piece by Spurgeon! How true and right he is! One day when we cross over to be with our Lord, we will see how many times the Lord has rescued us from ourselves…and our own sinful inclinations…and how humbling that will be. Our Lord uses so many things in our lives to shape and mold us into the likeness of His dear Son. May we never react with anger towards our Heavenly Father whose purpose is to complete His work in us..but rather…may our hearts be thankful for His infinite wisdom and love. Blessings dear sister! This was one of the sermons I read again and again when my prospects were being blasted. I thank God to be able to look back and see how He freed me from a snare. I Loved this post Christina. Yes, I can relate very well to it – especially when I was saved. God let me break my neck while driving under the influence in order to save me. I can relate to the painter’s story too 🙂 – When we were in college Robert was working up in a bucket lift painting a sign on a wall when the brake gave way and his lift was heading straight for a the electrical wires. It stopped just inches short of them because of a newly cemented post that had just been put in the ground. The cement was still even wet and it bent the post over, but stopped the equipment before electrocuting my husband. That is such a profound truth!! James is on the edge of the platform right now and my prayer is “do whatever it takes to bring him to the end of himself” I know that it is a dangerous prayer but I’m trusting God to accomplish his purpose by whatever means necessary. Please pray that James will become the man that he was created to be. Soon! !